24K Gold is the the softest and most malleable metal, and thus can be made into flakes. 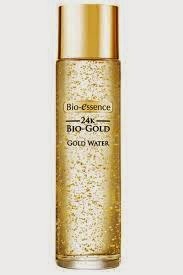 Once these flakes are absorbed by the skin, it releases active gold ions rich in trace minerals which then promotes blood and oxygen circulation, thereby improving the skin’s metabolism. It also stimulates the production of collagen and elastin that is already present in skin, and increases those collagen fibers to constantly keep skin firm and youthful. Altogether with it’s high anti-oxidant power, skin is then protected from harmful free radicals and is able to defy signs of aging such as dry/dull skin/wrinkles.